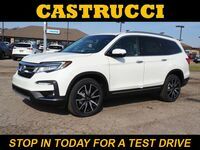 Drivers looking for a three-row SUV with a roomy interior, impressive fuel economy rating and quiet cabin will want to check out the 2017 Honda Pilot. The vehicle has been making waves in its class for its long list of standard features offered on all trim levels, but how does it compare to top competitors within its class? 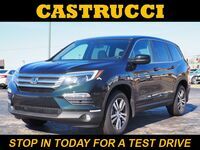 Our team at Matt Castrucci Honda is putting the 2017 Honda Pilot to the test with a head-to-head comparison against one of the 2017 Pilot’s toughest competitors: the 2017 Toyota Highlander. Read on for an in-depth look at the features and specifications offered on both of these SUVs! 152.9 cu. ft. Passenger Volume 144.9 cu. ft.
280 hp; 262 lb.-ft. Standard Engine Performance 185 hp; 184 lb.-ft. The 2017 Toyota Highlander comes in an overwhelming eight trim levels: LE, LE Plus, XLE, SE, Limited, Hybrid LE, Hybrid XLE and Hybrid Limited. 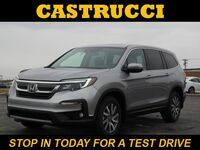 Three engine options are available: a 2.7-liter inline-4 engine that makes 185 horsepower and 184 pound-feet of torque, a 3.5-liter V6 that makes 295 horsepower and 263 pound-feet of torque, and a 3.5-liter V6 Atkinson-cycle-capable engine with VVT-i. All trims come standard with safety features such as the Pre-Collision System with Pedestrian Detection, Lane Departure Alert, Automatic High Beams, Enhanced Vehicle Stability Control, Traction Control, the Anti-lock Brake System, Electronic Brake-force Distribution, Brake Assist and the LATCH System. The 2017 Honda Pilot comes in five trim levels: LX, EX, EX-L, Touring and Elite. All trims come standard with a high-performance 3.5-liter V6 engine that makes 280 horsepower and 262 pound-feet of torque. All trims offer standard interior features such as Active Noise Cancellation™, Push Button Start, Cruise Control, power windows and door locks, Bluetooth® capability, Speed-Sensitive Volume Control, and 60/40 split flat-folding third row seats. Looking for safety features? All trims come standard with safety features such as Vehicle Stability Assist™ with Traction Control, the Anti-Lock Braking System, Electronic Brake Distribution, Brake Assist, the Multi-Angle Rearview Camera, the Tire Pressure Monitoring System with Tire Fill Assist, three-row side curtain airbags with rollover sensors, and the LATCH System. The EX and EX-L trims offer available safety features like the Collision Mitigation Braking System™, Road Departure Mitigation System, Forward Collision Warning and Lane Departure Warning. Those advanced safety features come standard on the Touring and Elite trims. 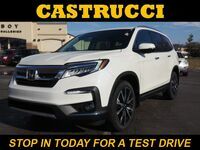 Drivers interested in meeting the 2017 Honda Pilot face-to-face are encouraged to schedule an obligation-free test drive online or stop in and see our team at our location in Dayton. 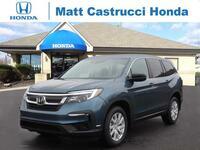 Have additional questions about the SUV before getting behind the wheel? No problem! 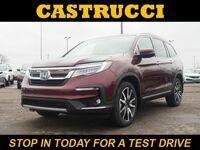 Contact a member of our team at Matt Castrucci Honda today!